Traveling can often be a spiritual journey, but there are some places throughout the world that are particularly divine. Whether you’re on a once-in-a-lifetime pilgrimage to a sacred site or are simply in search of some Eat, Pray, Love style soul cleansing, we’ve compiled a heavenly list of must-see (er, feel?) spots that will leave you breathless. Commonly referred to as the “Sacred Cenote,” this mystical cenote is found within the Chichen Itza archeological site in Mexico’s northern Yucatán peninsula. Ancient Mayans used these waters to cleanse themselves and to worship Chaac, the Mayan god of rain. Many human sacrifice rituals also took place here, adding to the ancient destination's otherworldliness. Located on the north bank of the Sutlej River near Mount Kailash in Western Tibet, the steam-dotted barren landscape has long been a spiritual destination. Walk the one-hour kora (pilgrimage route) and test your karma levels by reaching into a sacred hole and pulling out two stones — if both are white you have good karma. Pull up two black stones? Your karma is seriously subpar, which means you might want to consider another dip in the aforementioned cleansing springs. Also known as the Blue Mosque, this iconic building, with its six stately spires, has been an icon of Istanbul since it was built circa 1610. 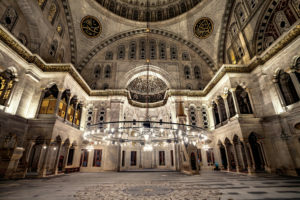 The massive structure is mainly used for worship and can hold up to 10,000 visitors at a time who pray beneath the mosque's more than 200 stained glass windows and intricately carved marble columns and statues. Native Americans believe the stunning red rock formations outside Sedona contain energy points. The incredible healing powers are known to cause subtle vibrations through the body like tingling of the hands and waves of heat. But even if you’re skeptical, the breathtaking views along the hike are enough to soothe your soul. These 87 riverfront steps leading to the banks of the River Ganges have long been used for spiritual ceremonies, from prayer rituals to cremation services. While many are privately owned, you can take in the impressive architectural structures — most built in the 18th century — with a morning boat ride tour along the Ganges. Often regarded as the most sacred Buddhist temple (or wat) in Thailand, this complex is located within the historic center of Bangkok. 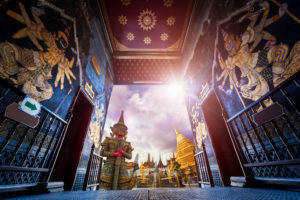 Don’t miss the Emerald Buddha, a 26-inch-tall dark green statue carved from a single jade stone that is said to bring “prosperity and pre-eminence” to those in the country where it resides. Word to the wise: You can look, but don't touch. The Thai King is the only mortal allowed to come in contact with this divine sculpture. The importance of this sacred spot spans Jewish, Islamic, and Christian history. It's most famously depicted in religious text as the spot where Moses communicated with God and received the 10 Commandments. You can trek to the top for a deeply spiritual meditation or prayer. And even if you're not religious, the panoramic view of the surrounding mountain ranges — including Egypt’s highest peak of nearby Mount Catherine at 8,625 ft — are miraculous to behold.